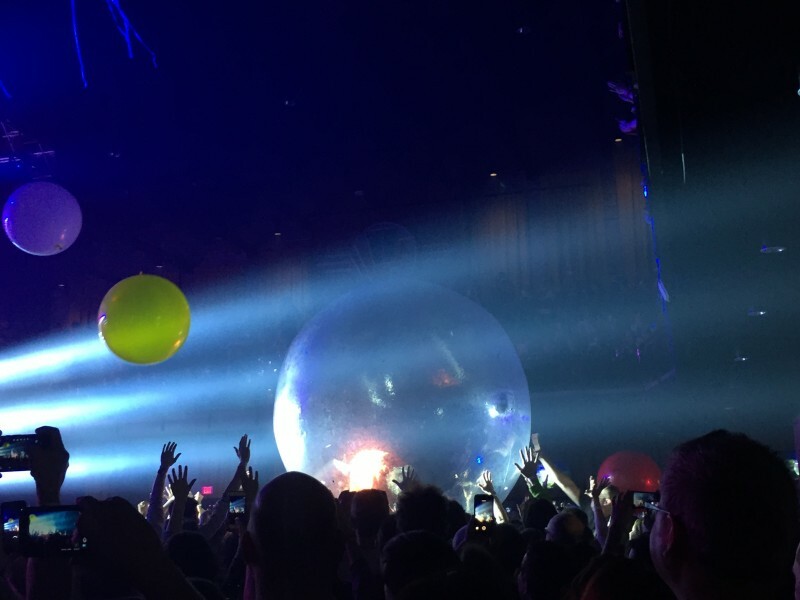 The Flaming Lips bring signature oddness and spectacle to Grand Rapids. No glow sticks, no animal costumes, not even a tie-dye shirt: the crowd waiting to get into 20 Monroe Live looked so resolutely normal that I briefly wondered if I was in the wrong place. A young woman with a streak of green in her hair walked alongside the line. “Guys, no knives, guns, or pepper spray,” she said. Inside, a friendly, middle-aged woman stood behind the merch table. On it were vinyl records and T-shirts with slogans either exhortatory (“Legalize All Drugs Now”) or dreamy (“There Should Be Unicorns”). There was soap for sale; handmade by Head Lip Wayne Coyne, it depicted a fetus lying in a red skull. I passed, given that it went for $150 and would probably have given me nightmares. Cherry Glazerr came onstage. Openers are something to be endured more often than not, but the band was noisy, raw, and kinetic: in other words, a blast. Frontwoman Clementine Creevy, all boniness and ragamuffin hair, shredded on guitar and whipped herself around like she was auditioning for the lead role in an Iggy Pop biopic. After the set, I ran into my friends Kyle and Angie. Angie is halfway through her pregnancy; she’s having a girl. We debated whether or not to the baby should be named Glazerr, Cherry, or Chariot. We waited. A young woman wearing cat ears blew bubbles; a twenty-something man with a third eye made of glitter paint drank a beer. To the side of the stage were large mushrooms; hanging above it were strands of LED lights; behind it were big balloons; on it were waiting instruments. The band took the stage with uncharacteristic nonchalance. Coyne said he knew it wasn’t rock and roll but he wanted to make sure all the special effects were in working order. A moment later, he asked us to pretend the band was just coming onstage now, but in a cool, memorable way. We complied. Accompanied by a familiar keyboard line, Coyne conducted the LED lights. Arm up, lights on. It was startling and impressive. The band launched into “Race For The Prize,” one of its finest songs. It’s an ode to two scientists searching for a cure (“They’re just humans with wives and children”). That song was spectacular enough, but “Yoshimi Battles the Pink Robots Pt. 2,” which followed, was stuffed to bursting. “Those evil-natured robots, they’re programmed to destroy us,” Coyne sang, lit from behind by psychedelic images on the large screen. Onto the stage came three people in costumes, one of which was, apparently, a carp in nautical clothing. It was that kind of a show. On “There Should Be Unicorns,” the next song, Coyne donned rainbow-colored wings and rode into the audience on a unicorn. What choice did he have, really? The middle of the show was less manic, allowing the band to lean into slow, beautiful grooves. However much the band embraces the big, neon side of performing, the music is still central. In front of me, a woman hopped onto another, laughing. They quickly backed up - just playing around, I thought, until I saw that they were making room. People were carrying out a shaking, barely conscious man of maybe twenty years old. I hoped that he would be all right. I still do. The concert continued, as it had to, although it took me a little while to get back into it. At one point heavy smoke caused a delay. The house lights came on, and the band left the stage. They returned before long for a strong, solid close, culminating in “Do You Realize? ?,” their most perfect song. It felt like half the audience was singing along. Afterward, I saw Kyle and Angie. They were swaying in a circle with two of their friends as “What A Wonderful World” played over the PA system. “Get in here!” I was told, so I did. The show that night was a reminder: It is a wonderful world. I thought of baby Chariot, growing away. She's going to love it here.